Late Wednesday night, after two flights and a 15 hour layover in Kuwait City, we arrived in Cairo, Egypt. We are in the “Visit the iconic monuments of the ancient world that are on our bucket list” phase of our travels right now. As we work through that list, we are also working our way west. After India, where I underestimated (by several thousand percent…) how challenging it would be to do anything… Egypt has been so refreshing. We’ve been staying at the Renaissance Cairo Mirage City Hotel. I don’t often gush about, or even name places that we stay at but, the service here and the experience has been exceptional. We were met at the airport, helped with our luggage and even helped through customs by the Navigator service at the hotel. Marcus said to the kids as we were on the highway “I’m pretty confident since the name of the hotel is on the side of the van that we’ll actually get to our hotel tonight”. And we did get to our hotel, and the exceptional service has continued throughout our stay. Artie thinks that staying here is like being in paradise. Nervous of a repeat of my utter and complete ineffectiveness in getting transportation and tours lined up within the country that I experienced in India, I booked all of our tours and activities in advance for Egypt. While this didn’t make for the most flexible stay, it did ensure that we got to see and do all of the things that we wanted to here. All of the tours that we took were well-run, comfortable and professional. 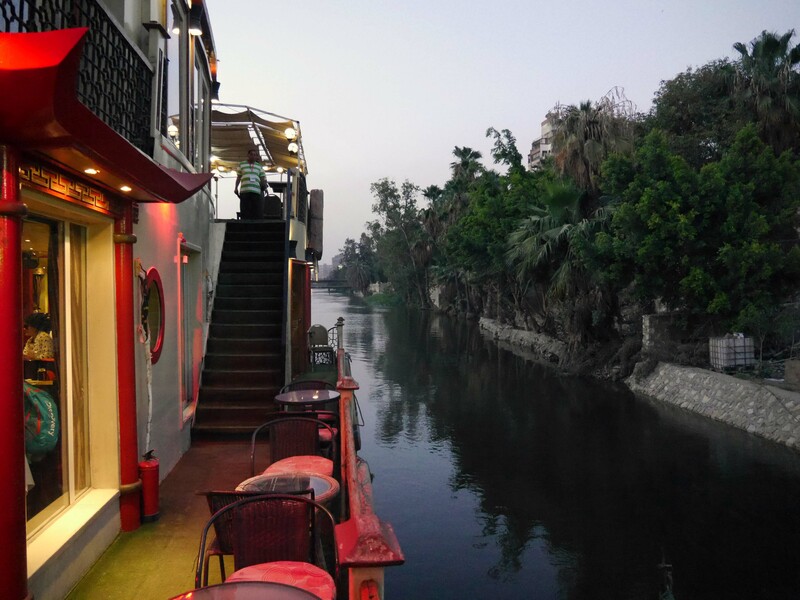 Our first evening in Cairo was spent enjoying a dinner cruise down the river Nile. I had a lot of tingly, wiggle in your seat, teenage groupie moments during our time in Cairo where it took a lot for me to compose myself and act like an adult. Seriously, I’m on a boat with my family on the Nile River! Aside from being on the Nile River, this cruise was about exposing us to some local arts and culture. 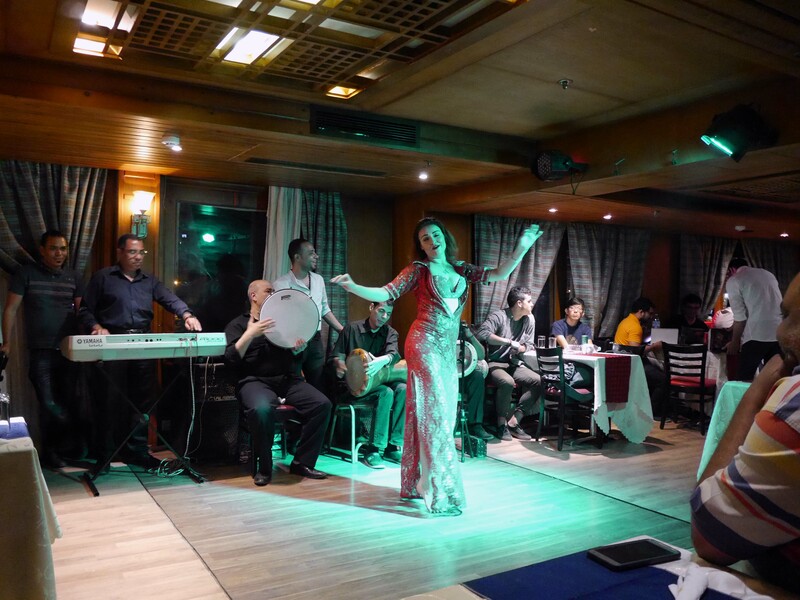 There was entertainment throughout the cruise, with a live band and Egyptian Tanoura (spinning) dancing. 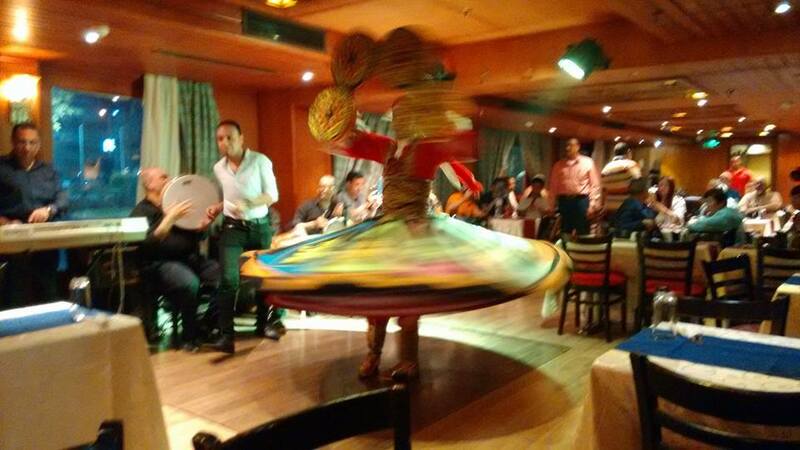 And… there was belly dancing. Artie was rather perturbed at me when the Belly Dancer started performing. He declared it to be “inappropriate”. I tried to explain that it was an art form, and a form of expression that was very important to the culture and history of Egypt. I’m not sure that he bought that though… and when the dancer came over to him to get him to dance with her… he hid under the table. The next morning, we were all up bright and early for a trip out to Giza to see the pyramids. Being up bright and early is generally only something that my children do on Christmas morning. The vibe within our family that morning was pretty close to Christmas morning too. I think that we all knew that we were in for something special. By luck versus good management, we managed to book our trips out to Giza for Friday which is the weekend in Egypt. This meant that there was next to no traffic, and our ride out to the pyramids was a smooth one. I think that the thing that struck us first about the pyramids was how visible they were as we approached from the city, and also how close they were to town. Our tour included a camel ride. When I asked Artie a few months ago if he would like to go on a camel ride to see the pyramids, his blue eyes almost popped out of their sockets while he nodded his head yes. Truth be told, I felt awful close to the same way about doing it. It was definitely a childhood dream fulfilled for me. In my opinion, seeing the pyramids on the back of a camel is one of those experiences that is worth whatever travel it takes to get there. As we swayed along on camelback through the sand, looking at the pyramids in the distance gave me that sensation of cosmic smallness and universal connection all at the same time. 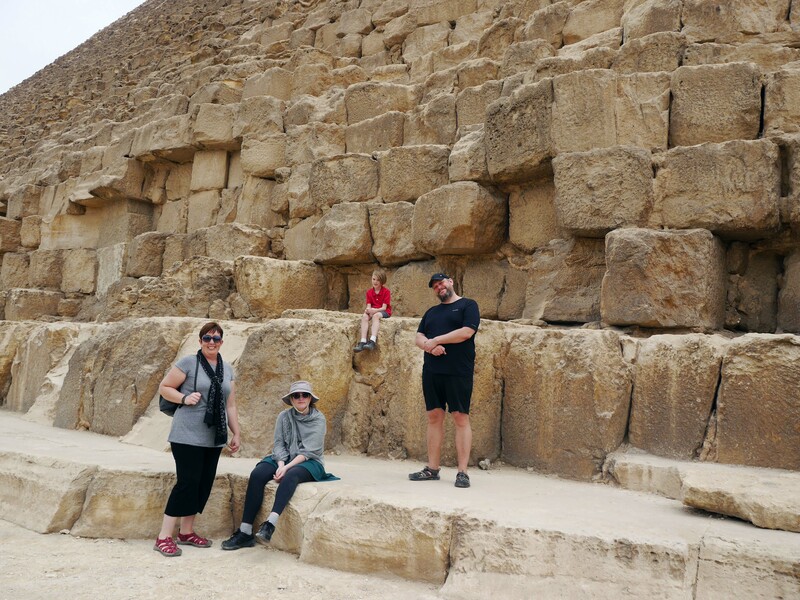 Having a guide for our time at the pyramids made a huge difference. We didn’t have to figure out how to get tickets, the security protocols, navigating around the site. That was all taken care of for us, and all we had to do was enjoy. 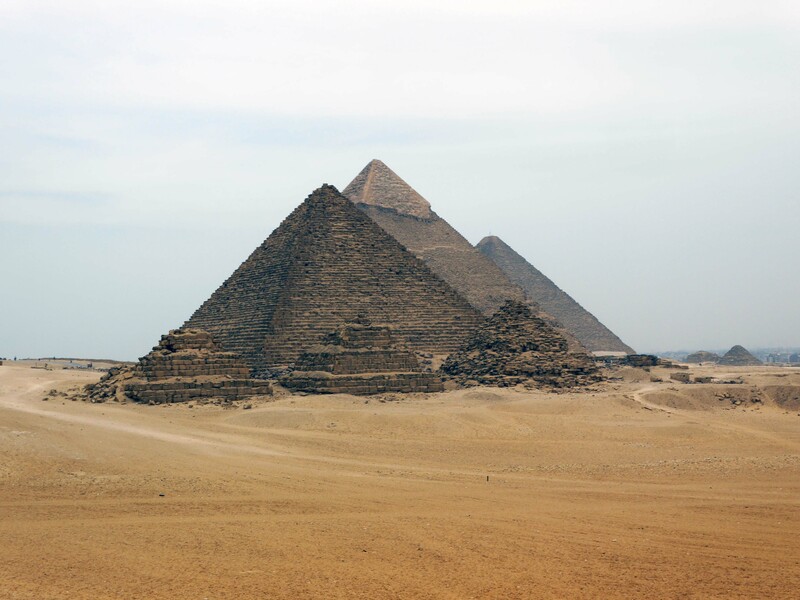 Something else that struck us about the pyramids was the fact that the stones used to build them, were not uniform. They were a variety of different shapes and sizes. Artie (really, really) wanted to climb to the top of the Great Pyramid. This is of course, not allowed. But, one gentleman who Marcus spoke with said up to 30 years ago, it was possible to climb to the top. BUT, because of the different shapes and sizes, if you did climb it you needed to remember your path or else you could get stuck. 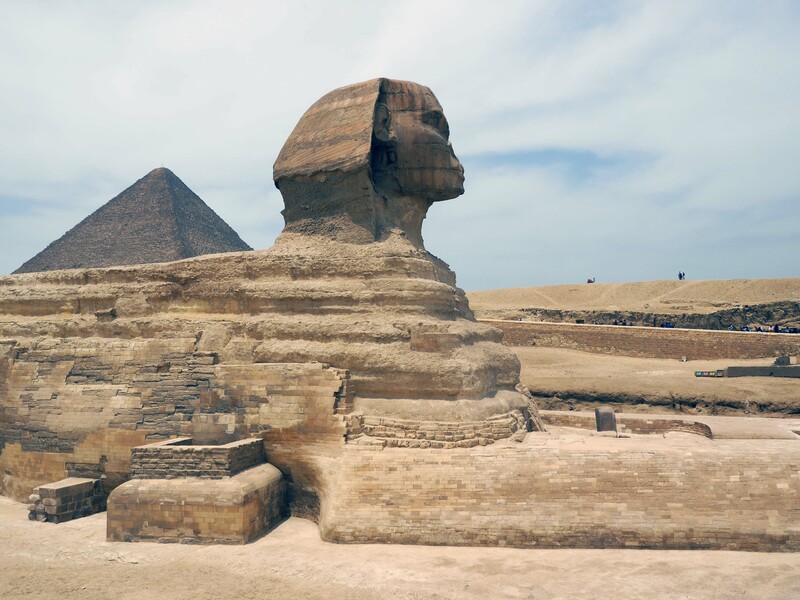 In addition to the pyramids, Giza is also home to the famous Sphinx. While I don’t envy the Sphinx’s fate of spending thousands of years within a necropolis… as I looked at those eyes carved from the limestone I couldn’t help but wonder what sites they had seen over the millenniums. Progress, wars, revolution… I could have sat for hours daydreaming by the Sphinx. 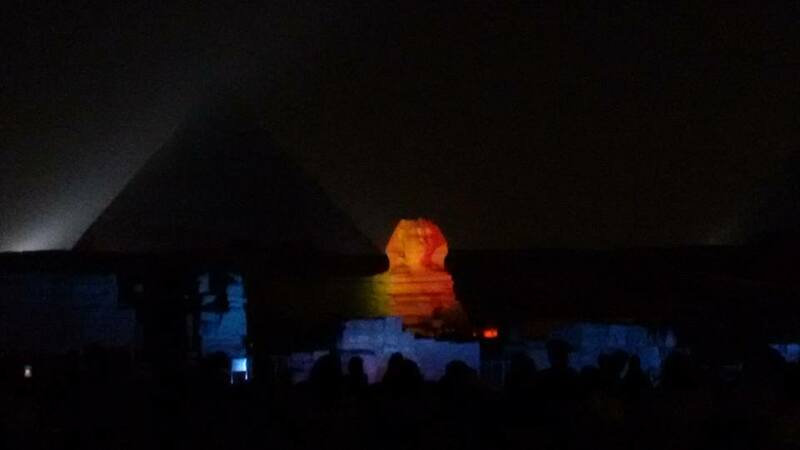 Later in the day, we returned to the site to see the “Pyramids Light and Sound Show Spectacular”. We’d been told before we came to Cairo, that this was a “must see”. The hour long, multimedia history lesson was incredibly well done and captivating. We’re using our last day here in Cairo as a rest day before we fly out at 3:10 tomorrow morning (I’m not sure what I was thinking when I booked that flight…) for our next destination. I’m pleased to say that I underestimated how wonderful our time in Cairo would be. Our stop here was brief, and we approached the city more as “tourists” than as “travelers”, but will be leaving Cairo with many good memories and only kind things to say about the people that we encountered during our time here. I’m so glad that Cairo has been such a welcome change for your family – you earned it after your time in India! I so envy your camel ride and visit to the pyramids…When I was about 11 years old I gave a talk on Ramesses II and the fact that on two days each year (traditionally the anniversary of his birthday and coronation) a shaft of sunlight pierces the gloom, illuminating his statue in the temple’s inner sanctum. This blew my mind – I was going to be an archologist! Didn’t happen but I’m still passionate about history, especially ancient history. 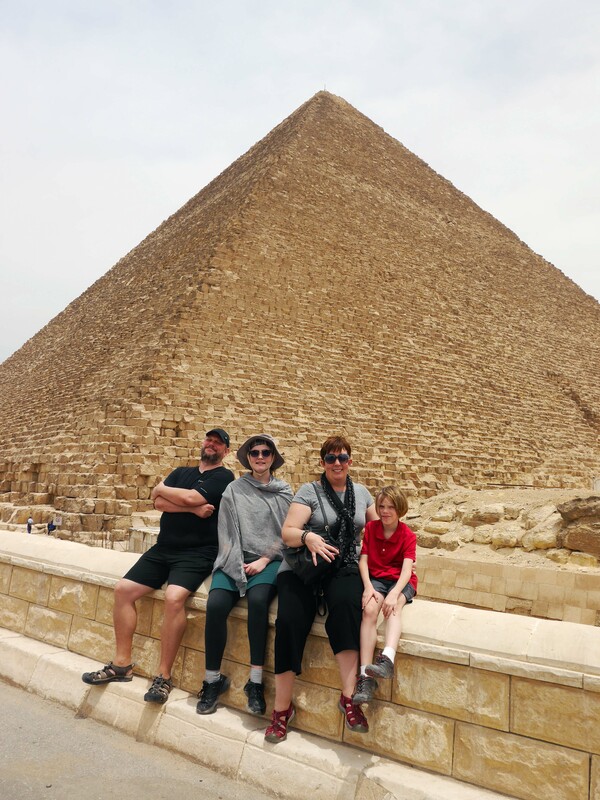 I’ve told so many people about your family’s “excellent adventure” abroad and the lessons your kids must be learning every day – where’s the next stop? I look forward to the next blog.